I'd heard that Smoque would be rolling out their new sausage product and hosting something of an open house on Saturday May 17th. I decided to take the family and stop by. The event featured Rudy "Tim" Mikeska of Taylor, Texas, the man who is behind the sausage Smoque finally selected as the one they are going to serve. The 100% pork recipe has been in Tim's family for well over 100 years and originated in Czechoslovakia several generations ago. While it's changed somewhat over time (shoulder is now used in addition to an 80/20 blend and the heat has been amped up in a slight "Texafication"), it's essentially the same recipe that was originally brought over to the U.S. by the Mikeska family. Of course, Smoque was hopping when we arrived at about 6:30. However, the line, which was slightly out the door, moved quickly and we were seated and eating about 25 minutes after we arrived. Even though business is often brisk, the folks at Smoque have found a pretty efficient way of handling it. As folks carried their food away from the counter, it seemed there was always a place for them to sit, as the crew directed traffic and bussed the emptying tables rapidly. While we stood in line, I had a chance to speak with Tim about sausage-making, as he passed out samples to the folks waiting in line. The sausage, which is smoked once in Texas and again at Smoque, is delicious. It's a naturally-encased product with no filler of any kind. The heat, which is subtle and nicely-balanced, hits the palate in the aftertaste. The definition is somewhat course and the texture is tender. I snarfed up about a entire sausage worth of samples and then, for $3, added a link to my order of baby back ribs. The sausage is also offered in a few other ways, including by itself or as part of of a platter with sides . . .
All in all, it was another delicious and satisfying experience at Smoque. It's great to have yet another tasty item on the menu and I look forward to making it part of my regular rotation. Last edited by ronnie_suburban on June 3rd, 2008, 11:06 pm, edited 1 time in total. I was there for the sausage yesterday as well. My thoughts? It's alright. If I'm going for a ribs and sausage combo, I think I'd much rather have the hot links at Honey1. That's not to say the Smoque sausage wasn't any good, because it was pretty tasty, but I was disappointed by the lack of heat. It doesn't surprise me to learn that it's a Czech recipe, Texified--when I tasted it, my first thought was that it was a smoked kielbasa. I realize they're not trying to go for a hot link, so I'm trying not to measure it by hot link standards, but it's hard when I love hot links so much. I'll continue to go to Smoque for the ribs and sides, and Honey1 when I want to throw some sausage into the mix. GardenofEatin wrote: I was there for the sausage yesterday as well. My thoughts? It's alright. If I'm going for a ribs and sausage combo, I think I'd much rather have the hot links at Honey1. That's not to say the Smoque sausage wasn't any good, because it was pretty tasty, but I was disappointed by the lack of heat. It doesn't surprise me to learn that it's a Czech recipe, Texified--when I tasted it, my first thought was that it was a smoked kielbasa. I realize they're not trying to go for a hot link, so I'm trying not to measure it by hot link standards, but it's hard when I love hot links so much. Isn't kielbasa Polish? In either case, I definitely agree that it's a completely different style of sausage than Honey 1 serves. This is definitely cured. Of course, it's rare that I encounter a sausage I don't enjoy. Kielbasa can be used as a blanket term describing all manner of Eastern European sausages - the probable etymology is Turkish, as discsused here and here. Based on our visit (missed both of you somehow!) I agree that Smoque's sausage is closer to a European sausage than a coarser American hot-link; it was indeed good, but not in the context I like, and I think it one place that the machine-smoker may not shine the brightest. I still remain a staunch fan of Smoque's chopped brisket and ribs, but will stick to Mack and the Adams boys for links. Santander wrote: Kielbasa can be used as a blanket term describing all manner of Eastern European sausages - the probable etymology is Turkish, as discsused here and here. I was very pleased with the texture of the sausage and especially the snap of the casing, which is one aspect I thought the SP machine might not handle well. According to Tim Mikeska, smoking them twice is what they do at his place too, although I don't know what kind of smoker they are finished on at his place. I haven't tried Smoque's sausage, but kielbasa-like is how I'd describe the sausages I was fed througout Texas. Not exciting, but I liked them better than Texas brisket. Many are the kielbasa style-- Southside Market in Elgin, for instance, is famous for this kind-- but others are ground beef in a tube, smoked fresh. For instance, in Taylor, where Tim Mikeska runs Rudy Mikeska's, his and Vencil Mares' Taylor Cafe both serve the cured kielbasa-like kind (Mares got his start working at Southside Market), but Louie Mueller's serves the beef kind. I have yet to run across something in Texas that struck me as being especially close to the Chicago hot link, however-- fresh smoked pork sausage with lots of red pepper flakes. Anyone know where that style comes from? ronnie_suburban wrote: The 100% pork recipe has been in Tim's family for well over 100 years and originated in Czechoslovakia several generations ago. I hate to throw out a history nit, but Czechoslovakia didn't exist 100 years ago. Austria-Hungary, maybe? my question also is how the hot links stack up next to Honey 1? If they are not as good, I will stick with the total package of Honey 1's ribs, hot links, and rib tips vs the nice brisket I have had a Smoque( I thought Smoques ribs were just ok, nothing special). If Smoques hot links are good, I may make a trip back their to give them another chance. jimswside wrote: my question also is how the hot links stack up next to Honey 1? If they are not as good, I will stick with the total package of Honey 1's ribs, hot links, and rib tips vs the nice brisket I have had a Smoque( I thought Smoques ribs were just ok, nothing special). If Smoques hot links are good, I may make a trip back their to give them another chance. Well, that's just it--they're not really hot links. It's more a smoked kielbasa. If what you're looking for are hot links, stick with Honey1. Again, this isn't to say that the Smoque sausage isn't good--because it is. It's just not a hot link. thank you, it may be worth a return trip anyway since I really like kilbasa, and prepare kilbasa on my smoker @ home, it will be interesting to get a taste of someone elses product. Thanks for the clarification. LOL . . . yes, I just going on what Tim told me. 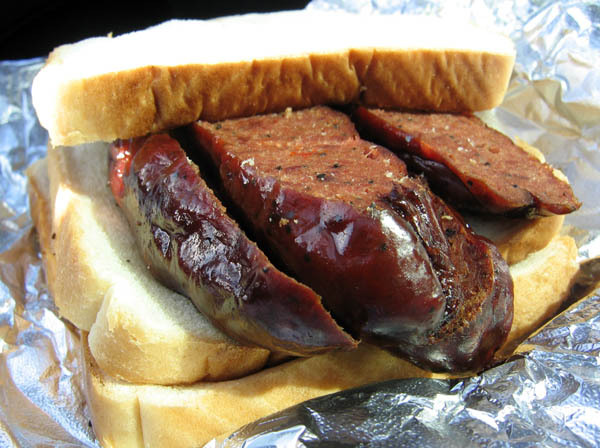 Mike G wrote: I have yet to run across something in Texas that struck me as being especially close to the Chicago hot link, however-- fresh smoked pork sausage with lots of red pepper flakes. Anyone know where that style comes from? I'd venture the inspiration for Chicago style hot links came up from the Mississippi Delta along with BBQ, Blues and Tamales. Far as hot links themselves, though this is speculation on my part, they may very well be the wild child offspring of the more sedate breakfast sausage. JeanneBean wrote: Or Bohemia! Go Bohunks! Sorry, Bohemia would still have been part of Austria-Hungary (then later, part of Czechoslovakia (which didn't exist 100 years ago), and now, part of the Czech Republic. I'm sure that's what he told you!!! Of course, after the Velvet Divorce, one no longer needs to continue to claim allegiance to Czechoslovakia and in fact, it may now be imperative to pick a side, lest one seem culturally, ethnically and/or nationally confused. Anyhoo . . . back to the sausage . . .
aschie30 wrote: I'm sure that's what he told you!!! Of course, after the Velvet Divorce, one no longer needs to continue to claim allegiance to Czechoslovakia and in fact, it may now be imperative to pick a side, lest one seem culturally, ethnically and/or nationally confused. I should have known better, as some of my best friends are Czech (seriously) and I've visited the Czech Republic numerous times. When I mentioned the sausage to my friends, they seemed very excited to 'czech' it out. 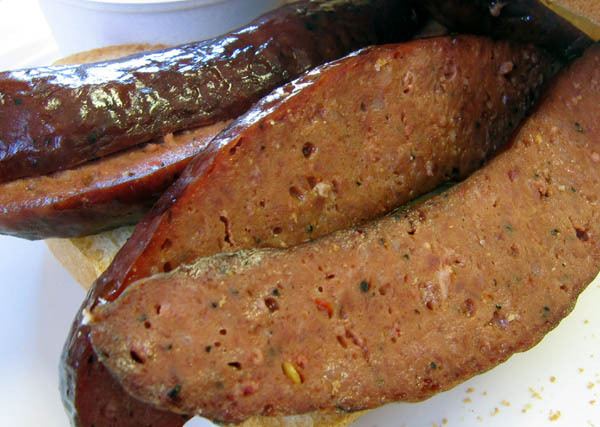 Mike G wrote: I have yet to run across something in Texas that struck me as being especially close to the Chicago hot link, however-- fresh smoked pork sausage with lots of red pepper flakes. 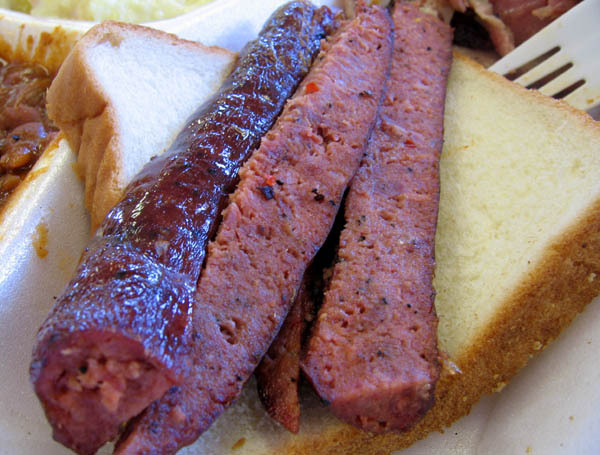 Hot links are more common in East Texas than elsewhere in the state. Wherever you find more black-influenced pork barbecue culture (as opposed to the mostly white, German/Czech, beef barbecue culture of Central Texas), you'll find hot links. Though not identical to some of the hot links I've had in Chicago, they're much closer to that than the lightly seasoned beef, pork, and turkey sausages of Central Texas. Thanks, Scott, for the salient information and the beautiful images. BBQ (and its connections) is such historically rich-cuisine. It's great to have the various aspects illuminated by those in the know. Well, I hate to tell you but Bohemians DID exist 100 years ago, therefore the recipe could be Bohemian. I've been urging Barry to serve a Texas style sausage since my first visit to Smoque, way back when. I'm very excited that they have finally found one that they can serve proudly. I'll be in this week to pick up an order and post my impressions. Speaking of summer reading, we suggest a look at the June issue of Gourmet Magazine, which is devoted to grilling. Our Roadfood column isn't quite about grilling, but it is about food, fire, and smoke: an ode to the great sausage barbecues of central Texas. Those who participated in last month's Roadfood Eating tour out of Austin will recognize the places in the story as most of the highlights of that Saturday, but not including the Round Rock donuts or Bud Royer's pies… or the warm companionship of enjoying the smoky meats with fellow food lovers. It is so succulent that if you plan to snap it into two pieces, you must treat it like a bottle of champagne you are about to uncork. Use two hands and significant pressure and be certain to push outward. When the casing has reached the breaking point, it bursts. Juice erupts and will splatter your face and shirt if it is not aimed away you, preferably downward toward the table rather than at the stranger sitting opposite. I'm a big fan of Honey 1 tips and links (OK, I am a bit cheap), but their links, I believe, are straight Moo & Oink hot links. While good, and hot, they are not really much like Texas sausage. The Honey 1 hot links have a very significant percentage of non-meat filler, which Texas sausage do not. Each BBQ emporium in Texas has a different recipe for sausage, with some as spicy as all get out. I haven't tried the Smoque sausage yet, and may never, as it would mean less brisket-maybe I can get it as an "add on." I had lunch at Smoque today because I couldn't wait to sample the sausage. Whenever I'm in Texas, I seek out smoked sausage almost as much as I seek out brisket. I ordered a 1/2 & 1/2 sandwich with sliced brisket and pulled pork and a sausage link on the side for an additional $3. The sausage tasted very representative of what you would find in a Texas BBQ spot. I've tasted spicier and I've tasted sausage with more garlic, but overall this is a good Texas style sausage. 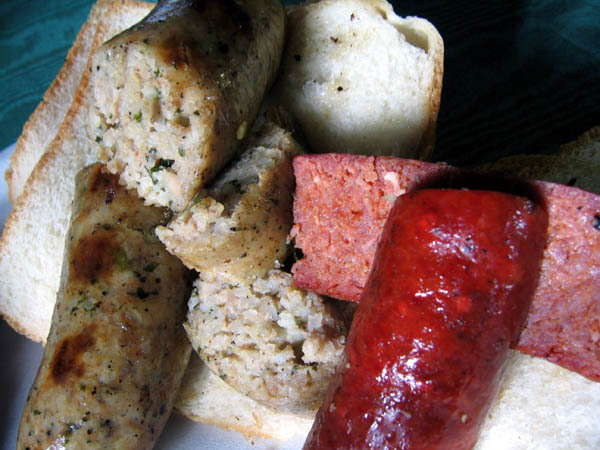 In a lot of places in Texas, the sausage they serve is in long links that are sliced into 1/4" thick rounds to order. The sausage that Smoque serves differers a bit in that it's a complete 5/lb link that is served whole. Other than that physical difference, I'd say that the sausage is pretty authentic. I feel that the comparisons to Chicago hot-links are unfortunate, because these are two different types of sausage, both of which I like very much. Oh, and by the way, have I mentioned lately how much I like Smoque's beans? They are really a fine example, using a variety of different beans, onions and a not too thick, not too sweet sauce. Lovely shots, Steve. It's nice to see the sausage by the light of day because you can clearly discern the fact that it's cured. Also, the seasoning and the excellent definition are visible, too. Boy howdy, I'm sitting here with a happy belly after my first helping of Smoque's new sausage offering. Upon entering Smoque I noticed there was a whole new, enticing smell hanging in the air. Slightly smokier than the norm and I could actually smell the Sausage as a distinct entity, seperate from the Beef, Pork, and Chicken. I tasted the sausage first without sauce just because it was the right thing to do. I was impressed with the flavor, but still, being the Sauce Guy that I am, I had to eat it with just a dab of the sauce. Absolute perfection! That tangy sauce juxtaposed against the savory smoky sausage created a whole new flavor that made me slow down and let each bite linger on my tongue just a little bit longer than usual. Thank you Barry for bringing the sausage on board! Now let me be the first to put down in writing what I think the next step should be. the back story starts about three weeks ago on a business trip to Cleveland where I discovered a hole-in-the-wall, honest to goodness dive called Mt. Pleasant BBQ. For those of you familiar with Cleveland's restaurant scene, Mt. Pleasant BBQ is the original, location, now divorced and operating independently, of the Whitmore's BBQ chain found around town. They have a menu that would make any Chicagoan happy including full slabs, long and short ends, tips, fish, and chicken. They also have an item called a "PB w/Beef" or a "PB w/Pork". Not knowing what a PB was (dear God, it couldn't be peanut butter, could it? ), I inquired of the cashier and was told that "PB" stood for Polish Boy; a smoked, locally made Polish Sasuage. The PB is placed on a bun and smothered either in smoked sliced brisket or pulled pork. Take that Italian Beef Combo! For the record, it was on this evening of May 20, 2008, that I proposed the concept to Barry Sorkin of a Chicago verison of the PB made up of Texas Sausage smothered in brisket or pork to for inclusion on Smoque's menu. He's already got all the necessary ingredients in house, except the long sandwich buns. Easily resolved. So, if in the near or distant future you see something on the big board at Smoque that resembles Cleveland's PB w/Beef or Pork, you can send your thank you notes and small donations to Buddy. My son is a regular commentator here and told me that I should make a comment about this topic since I had the pleasure of talking with Mr. Tim Mikeska when he visited Smoque BBQ last week. I am a retired professor of Slavic Languages who also loves good BBQ and especially good sausage. We could not resist the opportunity when Smoque announced their Texas Sausage. It was very busy last Saturday but Mr. Mikeska was near the door talking to all the patrons waiting to get inside. I asked where was his family from. He, of course, said Taylor Texas. I tried to then trick him by saying in czech, “tam zcela správně? Which meant, “where exactly? He very surprisingly replied in near perfect czech, “zcela správně? ?” I said yes, and then he told me that his grandfather was from the Moravian village of Zádverice, his grandmother was from a Bohemian Village that is no longer there thanks to World War II. He was very knowledgeable in not only the czech language but also his family’s very colorful history. It is refreshing for someone of his age and generation, 40’s, I assume, to know the czech language and to know so much about where his family came from. He told me he has his direct lineage all the way back to the 12 century. It was an immense pleasure to hear someone speak czech in his customary Texas drawl. Now, about the history of his sausage. He told us that his recipe originated with his great grandfather who was a butcher and sausage maker back in Moravia in the 1860’s. That recipe remained untouched for over 100 years until after his father passed away and he started adding more combinations of black pepper and red pepper. He said he used 3 different grinds of black pepper and a blended red pepper along with salt and garlic. When he started making it for resale, he had to follow the USDA inspector’s wishes and add a nitrite based for preservation. There are no MSG or soy fillers or anything but boneless pork shoulder and spices. I would have loved to have talked to him all day, but the line of people wanting into Smoque was long and he was very kind to have giving me the time that he did. The BBQ at Smoque is the best in this city hands down. I personally love the tender juicy brisket and St. Louis ribs. Now, my usual plate has that along with 2 links of Mikeska sausage and some more to take home. By the way, it’s not kielbasa in our language, its klobása which is totally different and Tim Mikeska has obviously made it his own by turning that old czech recipe into a Texas spicy sausage which my son the expert, his entire family, along with his old man here thinks is the best sausage anywhere. BuddyRoadhouse wrote: Not knowing what a PB was (dear God, it couldn't be peanut butter, could it? ), I inquired of the cashier and was told that "PB" stood for Polish Boy; a smoked, locally made Polish Sasuage. The PB is placed on a bun and smothered either in smoked sliced brisket or pulled pork. It's even better than that. Polish Boys at Cleveland barbecue houses consist of a sausage link on a hot dog bun topped with cole slaw, a pile of fries, then a flood of barbecue sauce. The Polish Boy Deluxe at Mt Pleasant adds some extra meat. I posted pictures of Polish Boys from Freddie's and Hot Sauce Williams here. We tried Hot Sauce Williams on one of our early trips to Cleveland and found it severely lacking. Until I discovered Mt. Pleasant, I was convinced that Cleveland had no examples of real 'Que. Now I'm looking forward to trying Freddie's on my next visit in July of this year. I would love to get over to St. Margaret's for some of that fish fry, but I'll be working until at least 7pm on Friday night. Next time you're in Cleveland make a point of visiting Sokolowski's University Inn for amazing Polish cafeteria food. It is one of Michael Ruhlman's favorite places and we have fallen in love with the place over the last few years since we started going. They only serve dinner Friday and Saturday nights, lunch during the week.